The Corowa district was originally inhabited by the Bangerang people. Their tribal lands extended north to the Murrumbidgee River and along the Murray River from Howlong to Berrigan and south to Mansfield in Victoria. In the late 1880-90s, one of the members of this tribe, Tommy Mac Rae was encouraged to make sketches in pen and ink of various tribal activities and the tribe's contact with white man. Some of his original work survives today as an important record of those activities. European settlements began to spring up in the area following the explorations and reports of Hume and Hovell, while another explorer, Charles Sturt, is considered the first white person to have acquired land. It is to the settlers, John Foord and John Crisp, that Corowa owes its existence. Foord took up land on the Victorian side of the river in 1850s and established the Wahgunyah Run. 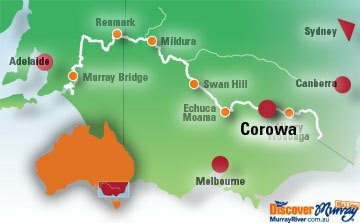 The boundaries extended from the Murray River to Black Dog and Indigo Creeks. He produced wheat and also became the flour miller, storekeeper, transporter, punt owner and bridge builder. In 1859 he purchased land on the New South Wales side and planned the township of North Wahgunyah, now known as Corowa. Corowa had a rapid population growth due to the discovery of gold in nearby Beechworth in 1852. Wahgunyah became a river port, and the district supplied meat and grain to the goldfields. The Rutherglen goldfield was discovered in 1859, and although short-lived, added further impetus to the growth of the town. Around 1862 a toll bridge was constructed (near the present bridge) and later demolished in 1894. The present iron, John Foord Bridge, was built in 1892. Corowa played a role in the negotiations leading up to the creation of the Federation of Australia in 1901. In 1893, at Corowa, a conference was held which accepted the motion that all future Federation conference delegates should be elected by the people, instead of being representatives of the various governments, and that they should draw up a constitution and submit it to the people for approval. Irrigation and navigation rights to the Murray were settled at a conference in April 1902 which culminated in the setting up of the River Murray Commission. Another title that Corowa can claim, was that of "rabbit population reducer". The introduction of myxomatosis in the district in 1950, along with some other regions, saw a sharp reduction in rabbit population levels. Federation Museum Queen Street, opposite Ellerslie Gardens. 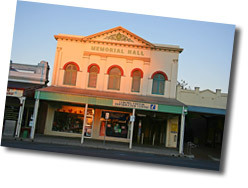 Opened in 1976 the museum houses an excellent collection of memorabilia of Corowa and district. The display was augmented in 1989 with material relating to the Federation of Australia and the part Corowa played in that development. Open: weekends 1-4pm, school holidays or by prior appointment. Admission charged. To preserve the quality of the artifacts, no photography is allowed inside the museum. St Johns Anglican Cathedral (1885) Federation Avenue. The building is a fine example of English ecclesiastical architecture with its wooden roof structure and stained-glass windows. St Marys Catholic Cathedral (1921) Parade Place is loosely based on the Romanesque architectural style. Corowa Court House (1886-1887) Queen Street. The courthouse was the location of the Federation Conference which commenced 31 July 1893. Constructed of two-toned red brick, it has a two-storey facade flanked by single-storey wings. The front verandah features plain paired timber posts. Ellerslie Gardens Federation Avenue, classified by the National Trust with heritage significance. The gardens feature a mounted bust of Queen Victoria. Corowa Ponds Sanctuary Federation Avenue opposite Nixon Street, on the banks of the Murray. This area is visited by approximately 100 different bird species, including the rare freckled duck. At the Nixon Street end of the sanctuary is a display of the local birds. Former Corowa Railway Station John Street, was constructed in the 1880s and is typical of vernacular railway architecture featuring a single-storey brick building with front verandah and cast-iron supports. The platform roof is of iron over cantilevered steel brackets. It has a National Trust classification. Collendina State Forest: The entrance is signposted "Wagon Wheel Reserve". Situated on the banks of the Murray it is an excellent fishing and picnic spot. Camping is permitted. Corowa Gliding Club: Corowa Airport, Redlands Road. The club operates each Sunday all year round. The district is renowned for its thermals and during summer it is common to see many gliders circling and climbing to gain altitude. It is quite common for flights to reach distances of 300-500 km. Air experience/joy flights are often available. Corowa Jump Shak - Skydive Victoria: Corowa Airport, Redlands Road. Professional instructors teach pupils on the techniques of solo and tandem jumping. As the weather conditions and facilities are excellent, Corowa has become the most active parachute jump area outside of the capital cities and has hosted the National Parachute Championships The championships are held during December and January. National Federation Festival, first held in 1980, celebrates Corowa's rural heritage and Federal links and includes a flag-raising ceremony, ecumenical church service, grand parade, a town fair, music in the park, brass and pipe bands, horse and car racing and a bush dance. It is held over the long weekend each January.